A car trip to visit Grandma on her birthday feels like “an eternity.” What happens when you just get too bored? 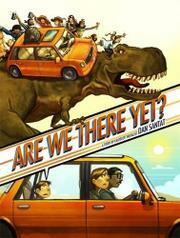 Most parents on a car trip have heard the titular question, but in Caldecott medalist Santat’s hands, the familiar trip becomes an unforgettable romp through time and space. As the moment of absolute boredom reaches “forever,” a clever twist forces readers to turn the book upside down and read “backward,” time also going backward. The family car travels back to the Wild West, the days of Blackbeard, medieval Europe, and ancient Egypt. As the parents grow increasingly anxious (jousting was not part of their plan), the oblivious kid in the back continues to whine, finally noticing the moment the car is in when it reaches the age of the dinosaurs. In another literal turn of the book, time now flies by too quickly. The family and other fellow time travelers—met in moments of boredom—hurtle through time into the future, arriving at Grandma’s address only to find her home is no longer there, and they have missed the party. But not to worry, it is only the mind playing tricks. Employing both comic-book–style panels and full-bleed spreads, the mixed-media illustrations are full of humor, and the changes in point of view keep the telling dynamic and engaging. Mom is white, Dad slightly darker-skinned, and the party guests (when they finally arrive) are thrillingly diverse if mostly a bit long in the tooth.